With finals looming and graduation as close as can be for some students at the UC San Diego School of Global Policy and Strategy (GPS), we tracked down a few of the School’s 2016 graduates who were in these shoes one year ago. Here, we go beyond the statistics about where they are now for a candid look at life after GPS. But since we mentioned stats, it’s worth noting 96 percent of the 2016 cohort is relevantly employed, with more than half in the private sector, a quarter in the public sector and the rest making an impact at nonprofits, multilaterals and in other pursuits. Discover the ways in which their education remains useful today. 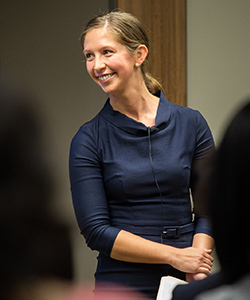 She works as a … research assistant at the Center for Global Development (CGD) in Washington, D.C. The GPS skills she uses most include … the ability to quickly synthesize lots of information from various sources and lessons in quantitative methods (QM) and geographic information systems (GIS). How long did it take you to land your position and, really, how challenging was it to get there? It took a month. The hardest part was sifting through development job postings and picking the three or so I would apply to every day. My interviews also were challenging. The core research I was hired to assist with was in international forestry policy — a totally new area for me. I spent many hours reading up on the subject and practicing for curveball questions. In the end, my internship experience in a think tank, background in international development fieldwork and final paper from a GIS class at GPS got me across the finish line. Can you detail your typical workday and how it differs from when you were a graduate student? I work with four of our senior fellows on a range of subjects, including policy outreach in Asia, Europe and the U.S., and in conducting preliminary research for a paper and writing a policy paper. My typical day is quite busy juggling these! I usually start at 6 a.m. and end at 9 p.m. But I have a flexible work schedule, and I am able to spend time throughout my workday doing things like walking my dog, yoga or running. I’ve had to readjust from the laid-back culture of San Diego to the more formal and hierarchical D.C. culture. Ironically, the adjustment has made me feel more laid back about my schedule, since much of it is out of my control. It’s also been a lifestyle change to not have the beach and mountains as my backyard. I’m still figuring out how to keep up my hobbies of backpacking and rock climbing from DC. What do you wish you knew in your last quarter of GPS about entering “the real world” that you know now? I knew starting a job in D.C. in an election year wouldn’t be predictable. But I wish I had known how intertwined the international development field is with U.S. politics. Development people have one eye nervously on the threat of budget cuts and an uncertain future of the U.S. Agency for International Development. It often becomes an all-consuming topic. I wish I had studied more on the Congressional appropriations and interagency processes and familiarized myself earlier with sources for tracking and validating information. 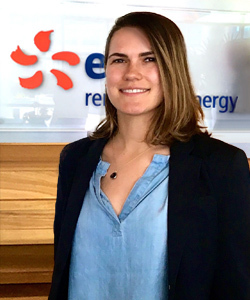 She works as a … rotational training program associate at EDF Renewable Energy in San Diego. The GPS skills she uses most include … economic analysis and lessons from business courses. If she could relive any moment of graduate school it would be … the night she, Ryan and Arjun threw water balloons off of Ryan's three-story balcony at 3 a.m. I was offered the rotational training program early spring quarter. My time at GPS prepared me well for the role. I went through the standard interview process, which lasted two days, as well as a group dinner with the interview panel and other candidates. In this role, I will work with four different departments over two years. The first rotation I worked in was construction and engineering, where I streamlined balance of plant design and costing processes. In my second and current rotation, I work with the valuations team, where I price projects that come through our pipeline, as well as perform research on special topics. (Outside of work) I do a lot more painting. When I was in high school, my art teacher wanted me to go to art school. I chose physics instead. Now I'm delving more into the San Diego art scene. ‘The real world’ is very liberating and enjoyable, where there is ample time to pursue various interests. With that being said, do expect to work well into evenings and nights often. 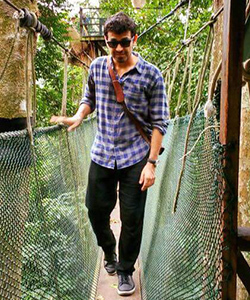 He works as a … senior analyst with Nielsen Holdings in Ho Chi Minh City, Vietnam. The GPS skills he uses most include … quantitative methods, statistics and lessons from Richard Sinkin and David Michael. If he could relive any moment of graduate school it would be … the graduation ceremony. It took somewhere between three and four months for me to move from my first phone call to my offer letter. It wasn't the easiest process because all of my interviews and case studies would be at night in California to match Vietnam time. I'm glad it all worked out and I'm here. A typical day includes lots of data analysis and business problem-solving for my client, Unilever, ranging from answering market share movement questions to coming up with strategies for improving product distribution. My day also includes lots of amazing Vietnamese food. Graduate school was hard work without pay. Now I'm being paid to work hard. And being in Southeast Asia, it's cheap and quick to go around. I'm exploiting that advantage. I have even been able to go back to reading for fun again. The company needs me more than I need them. If one has this attitude while applying for jobs, I think maintaining confidence levels can be much easier. Now in the company, I realize how they're always under constant pressure to find new talent. We have to be more confident about our own skills and never undersell ourselves. She works as a … consultant at World Bank Group in Washington, D.C. The GPS skills she uses most include … quantitative methods, economic development and international economics. If she could relive any moment of graduate school it would be … working with friends at a coffee shop in Pacific Beach or at UC San Diego’s Biomedical Library and letting loose with dinner and drinks after. 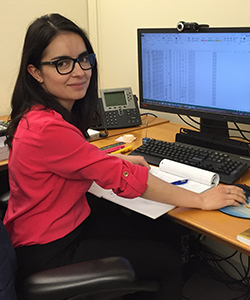 In July, Parul Agarwal ‘15 shared information about a consultant opening in her unit at the bank. It had always been my dream to work at such an influential institution in international development, so I applied. After a couple of phone interviews, I got the good news. I joined the bank in August. It has been challenging to work at such a competitive institution, surrounded by extremely talented people from all over the world. It requires you to be learning all of the time and to work as hard as you can to best represent your country and your academic alma mater. Even though I work long hours, I feel I have more time to hang out with friends, attend events in the city and workout. My day starts with an occasional workout and a 40-minute commute by bus, which allows me to enjoy the capital’s scenic beauty. I divide my workdays between two units at the bank: the Development Economics Group and the Poverty and Equity Global Practice. I spend most of my day working with either Stata or the bank’s own software and use my lunchtime to learn new things by attending talks and academic research presentations offered daily. Work and study should be a priority, but it is equally important to spend quality time with friends and go out. I love D.C., but I miss a lot of my friends and the relaxing feeling of watching the sunset from San Diego’s beautiful beaches.